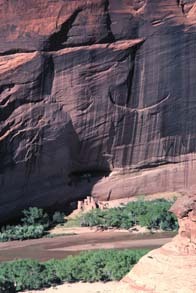 Canyon de Chelly National Monument is within the Navajo Nation in Northeast Arizona. The monument actually encompasses several canyons, including Canyon del Muerto, Black Rock Canyon, Monument Canyon and Canyon de Chelly. Clck images for larger versions. 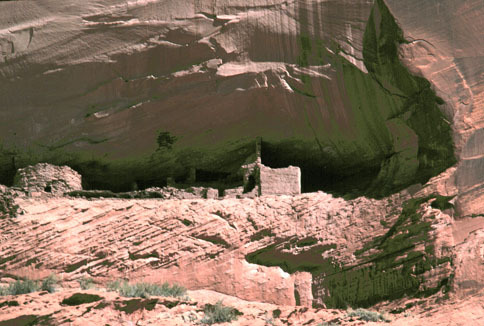 White House Ruin is the largest and most spectacular of the many Canyon de Chelly ruins. 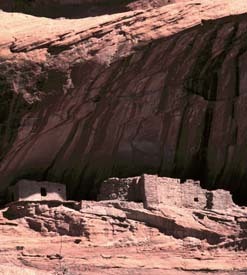 The lower ruin is visible at the cliff base adjacent to the shade line. 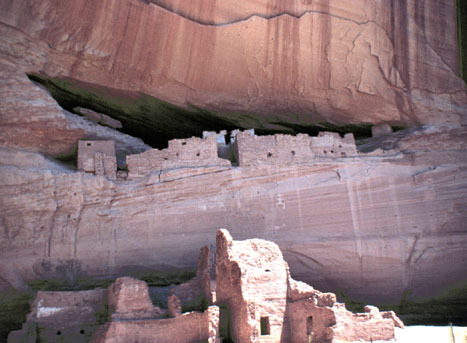 The upper ruin of White House ruin is located in a cave. 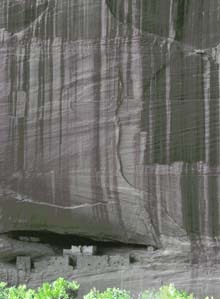 One of the most dramatic sheer cliff walls in the southwest crowns and dwarfs the ancient dwelling. 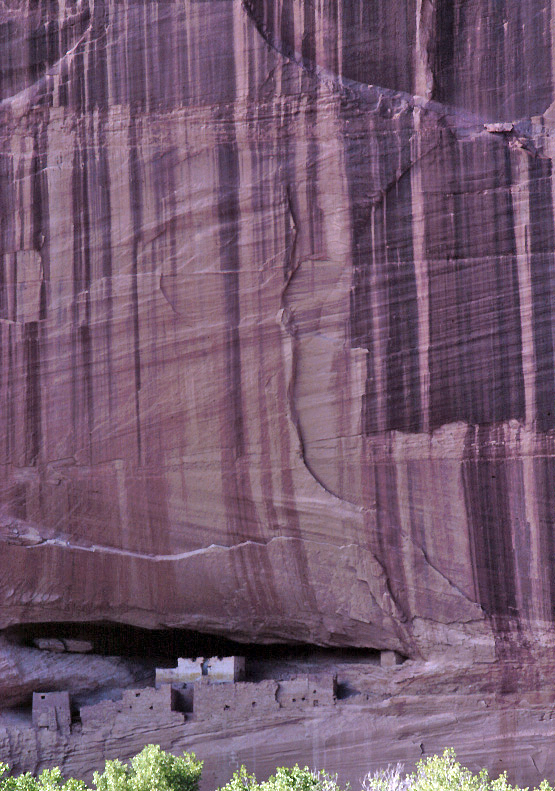 Less than half the cliff's height is visible in this frame. 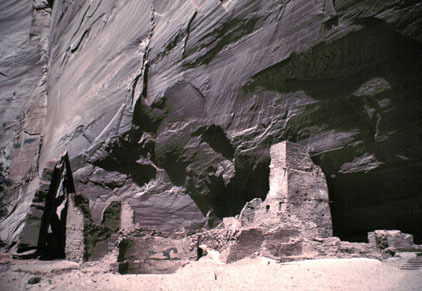 The lower ruins rose high on the cliff walls, making access to the upper ruins possible. 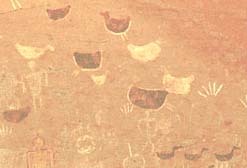 The ancient wall impressions and rock art reveal the locations of previous room walls and roofs. 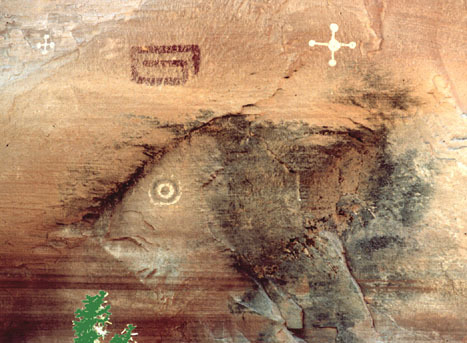 In this extraordinary example of rock incorporation the concentric circles conveys the fish image. 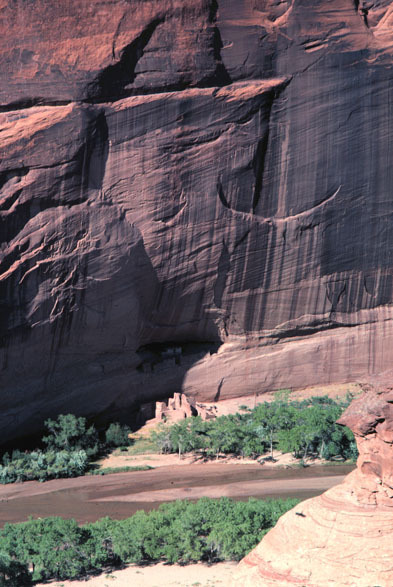 Canyon de Chelly rock art is bountiful. Antelope House is named for animals depicted in the nearby pictographs. This canyon floor ruin includes a circular plaza between two room blocks. Many of the ruins are built on ledges above the canyon floor. 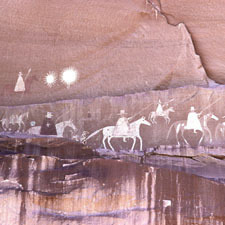 Navajo Pictograph of the Narbona Expedition. © 2015 by James Q. Jacobs. All rights reserved. Photo Stock. Thanks to Don. P. Morris for correcting my architectural information about Antelope House.